The Carpet Chemist carpet stretching service requires the use of a carpet stretching tool called a power stretcher. A carpet power stretcher is adjustable and extends the entire length of the room. But before we can set up the power stretcher, we need to detach the carpet from the tack strips all the way around the room. This is why all of the furniture must be cleared out of the room prior to our arrival. We also ask that you vacuum the carpet where we will be re-stretching the carpet for you. Remove furniture. Furniture must be cleared out of each room we are re-stretching prior to our arrival. We can not wait for you to move it while we are there. Vacuum. Please be sure to vacuum once the room has been emptied, so that we can safely crawl around on our hands and knees and use our carpet stretching tools. Secure pets and children. 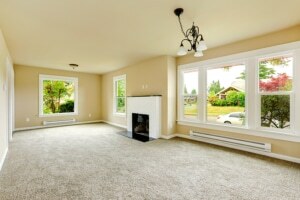 We know how hard it is to keep an eye on small children and pets, but we use sharp tools and equipment and are hyper-focused on your carpet and getting it stretched properly. Kids and pets are curious, but we don’t want them getting hurt.